My kids are so excited that Halloween is just a day away – and after some last minute Halloween candy shopping, I think we are all ready to go! Now if you are looking for something fun to do for your Halloween party or favorite trick or treaters, I thought I would share this little goodie bag I put together using the fun Howl-o-Ween bundle with my oh so favorite adorable owl! Make life easy on yourself and start with the Kraft Tag-a-Bag gift bags. They are packs of 10 ready-to-go bags that are food safe for only $3.50. Perfect for stamping or embellishing! 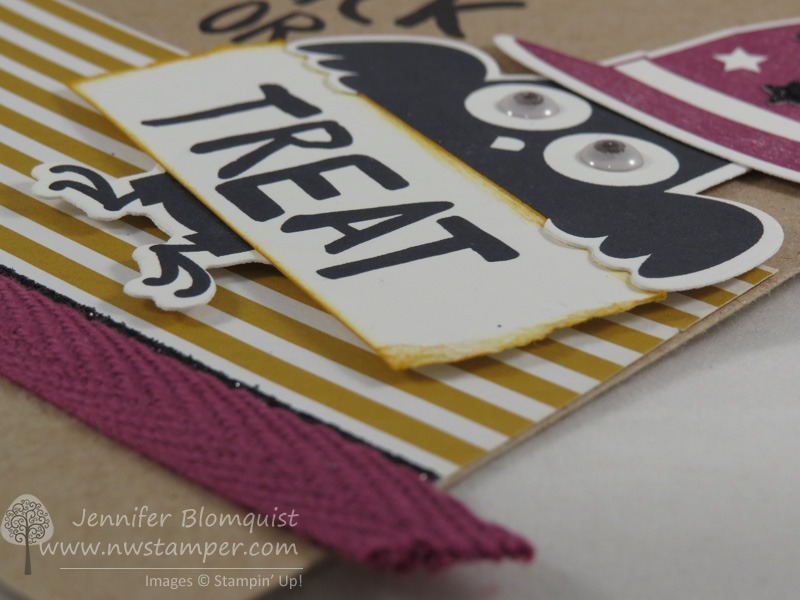 I stamped the “treat” from the “trick or treat” sentiment onto a piece of scrap cardstock and then sponged it with Delightful Dijon ink. Rip the ends of the white strip for a more interesting “rough edge” look before sponging! Then stamp your owl and cut him out using the matching framelit. Gotta love things that make it easy to cut out! Now, the one thing you will notice once you do that is that when you layer your sentiment over your owl, his feet are covered up! Now that is no good! But it is an easy fix! Do a little surgery on your owl by cutting him in half along the top of his tummy stripes. Then glue him to the back of your sentiment so that his arms are holding the sign and his feet are sticking out the bottom! And do you see his eyes? How fun are those?! Just take the White Perfect Accents and place one on top of each of his eyes, then color in the centers with a black sharpie. Easy, almost-googlie eyes in seconds! My owl needed a fun hat too… so back to the Howl-o-ween stamp set I went, and stamped the hat in Rich Razzleberry and then added some fun accents by adding Black Glimmer paper stars over the white stars! How did I get those stars you ask? Just grab your Star confetti punch and a scrap of Black Glimmer paper and punch away! 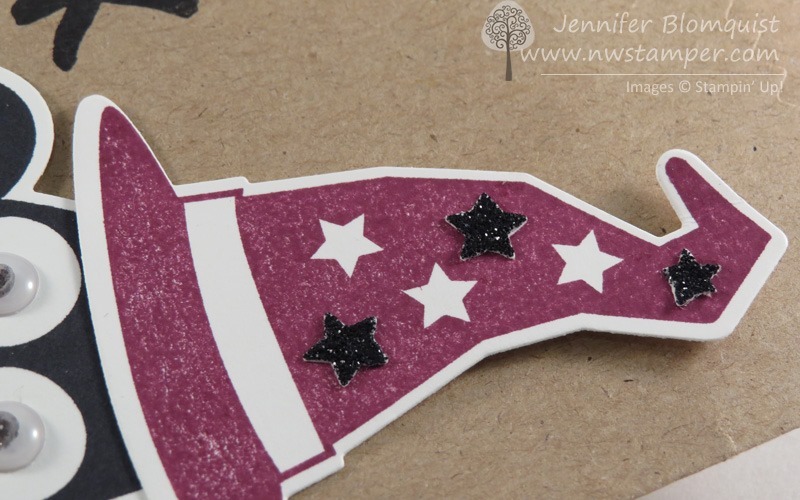 Pick up a few of the confetti pieces and glue down using the Fine Tip Glue pen or your favorite liquid glue. Finally layer everything down on your treat bag including some strips of your favorite patterned papers. I used the In Color Envelope Paper in Delightful Dijon to add some stripes, then a tiny strip of Black Glimmer Paper covered by a piece of the Into the Woods Razzleberry ribbon. Seriously people! This ribbon is so yummy to work with!! 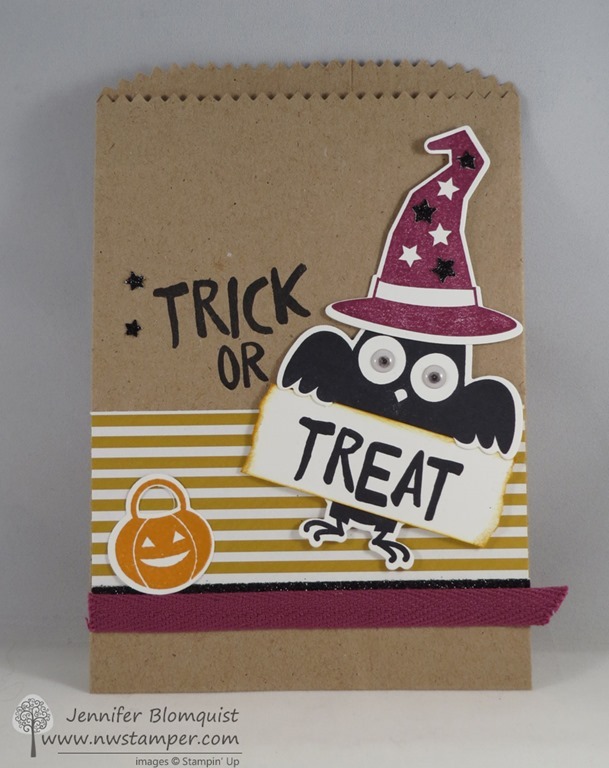 Stamp the rest of the “Trick or” above your striped paper, add some extra confetti stars, and of course the Jack-o-lantern from the Howl-o-Ween bundle for our owl to collect his treats in! And if you don’t have this stamp set yet… it is still worth the add! I know I’ll be using it for scrapbook pages since all the images are a really good size for layouts. Plus, I’ve already seen some fun ideas that I’m going to start playing with for using the owl and hat die for Christmas and even Thanksgiving pilgrims! So stay tuned for that! 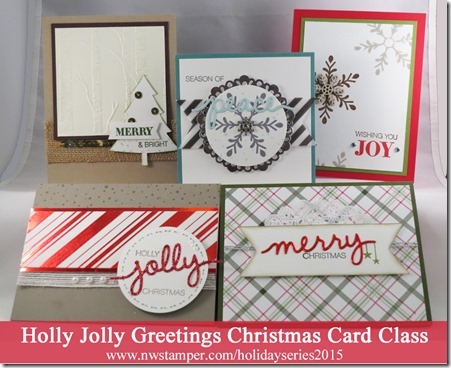 Reminder – Holly Jolly Christmas Card Kits are going out this weekend! Is yours? Just a quick reminder that those of you who have told me you were planning on ordering your kit, don’t forget to sign up today so I can get your kit out with the rest that are going out this weekend! You have a few options too – kit w/ stamp set, just the kit, pdf instructions only. So pick your favorite and RSVP now. use Hostess Code FHRCKER7 to get a special thank you from me!